Preheat the oven to 350. Either line a 9x13 pan with parchment or grease thoroughly. In a large bowl, mix oats, brown sugar, cinnamon, flour, chocolate chips and salt. Add remaining ingredients, gently mixing it all together. Press the mixture into prepared pan and bake for 25-30 minutes. Cut the bars when they are still warm... if you wait too long they will be too hard! 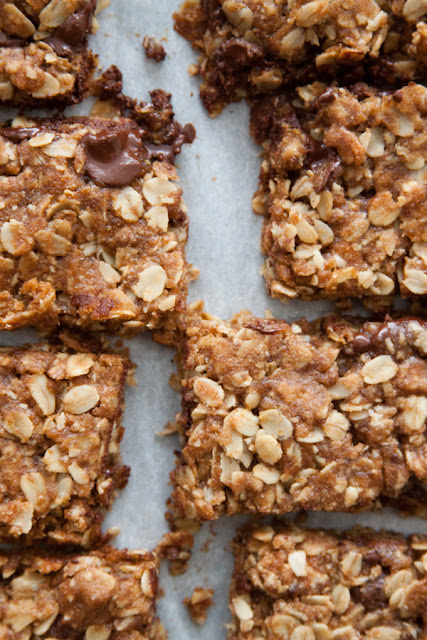 I've always been tempted to make granola bars at home. And then I remember that I'll want to add too many chocolate chips for them to still be classified as granola bars instead of cookies. Your look like they have the perfect ratio! Thanks for the recipe!